CHARLOTTE MINICON :: JANUARY 22, 2012 :: CLIFF CHIANG!! Get ready people, the Charlotte MiniCon is back! Shelton started the MiniCon waaaaay back in 1977 ( I was 5 but who’s counting ). We’re still talking to all our friendly nearby creators to see who can make it to the show but I wanted to let you know about a very special out-of-town guest who will be paying a visit to the Queen City just for this event! 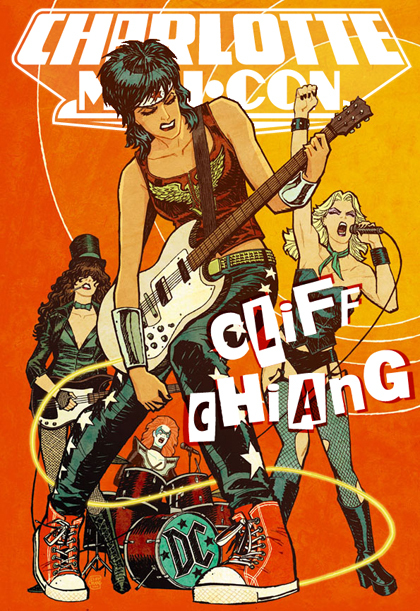 Cliff Chiang is going to be here to celebrate the 35th Anniversary of the MiniCon! Cliff is currently turning out some of the best work of his career as the artist of DC’s Wonder Woman, but he’s also known for adding his distinctive style to books like Zatanna, Doctor 13, Neil Young’s Greendale, Human Target, and Green Arrow/Black Canary, among many others . Meet Cliff Sunday, January 22, 2012 at this incredibly fun, family-friendly event! Mark your calendars and check back here for more details about the MiniCon or join our mailing list to make sure you hear about any events we have coming up.